That's an awesome tank. I've never seen yours or Vicki's tank ever but I know they must be huge. Col coral and climbing things. Your crabs must be super happy. That's beautiful! You're giving me ideas - I love the water ponds in a gravel area - I have to brush sand off every time I change my water dishes, so there's always a bit of sand spilled here and there when I'm done. 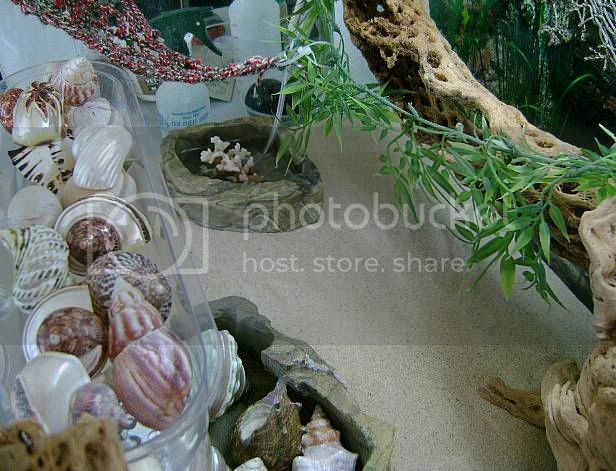 Show us some pictures after the crabs have rearranged things lol, as you know they always do! Really beautiful set up, thanks for sharing! as for the items that is years of collecting//adopting//hitting great opportunities etc. My whole goal is to create a natural habitat so that is what inspires me to get those types of decor. I like it more simple than complex because of the cleaning aspect. oh! well you have collected BEAUTIFUL things! It looks amazing! 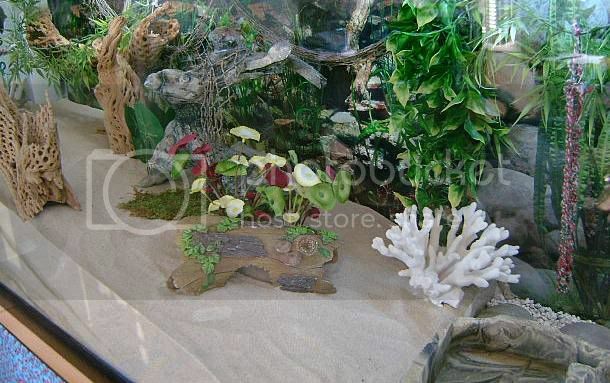 I wish I could shrink to the size of a hermit crab just so I could explore the cage and climb everything! Hermez, I agree simple is much better. Mine is a little complex and I've been wrestling with the cleaning. I am planning how to rearrange it after my next deep clean in a few weeks. I just bought a beautiful piece of coral much like yours for $4 on ebay (TheShellGal has great prices on coral and shells and combines shipping charges, she send cute little gifts too) and I love how it looks in the tank, as well as giving my little guys some healthy calcium to munch on. How do you guys with millions of crabs ever change substrate without digging up crabs? It's just a question I've had forever. you do dig them up- I had 4 I had to ISO and a few that were ok to put in- usually its not that much 1-2 maybe, This was a rare incident. Its what you do with them and how you handle the situation. People are so afraid of the crabs dying--they are more hardy than not. I have an occassional loss. Now that I have only 3 E's left I bet I will not have many losses at all. My large Straw does destroy my tank when he wants to molt and I think that is why I lost a straw recently. like a mother who has 40 children..........you just know. Seriously you keep track by taking pics and noticing shell changes etc etc etc. Sometimes you can get confused then you have to research and figure it out - if that is all you have to do with your spare time you should not have an issue. I have 4 dogs and a house to run let alone mod many forums and now my own- work fulltime.......so I am slacking a bit in identity with a few but I will figure it out. Molts dont phase me anymore.......I used to keep track and still do but if I miss one or 2 then it is what it is, I am past like 300 molts so you get used to it. She is the goddess of hermit crab owners. 300 molts! Wow! I'm only at one and a half (Sherbert is molting). How do you have 40 crabs plus 2 dogs?!? That's amazing! Do you ever have time to relax? That tank is great! 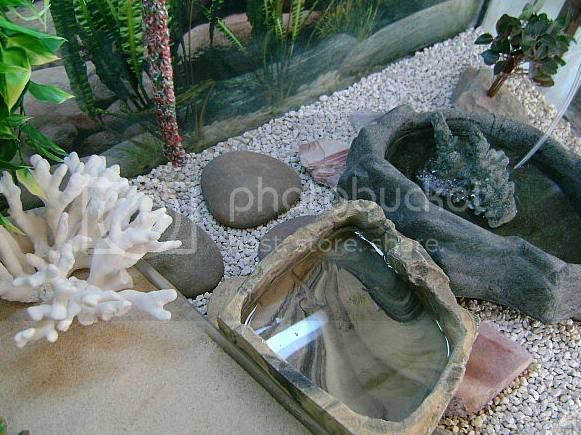 In the last picture, what are you using to keep the sand separate from the gravel and where do I get it? 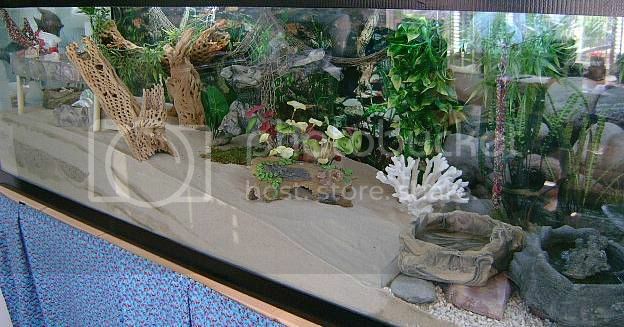 I'm getting a larger tank and would like to do something similar so sand is not drug into the watering hole. Thanks! Thanks its just a piece of plexi glass - I have them cut in all sizes and heights for the tank dividing. Now I have 8 crabs, one tortoise, One dog (the laziest in the world which helps) and might possibly be getting leopard geckos. I sort of have had my time with fish and they all died so yeah... I have hermit crabs . Snd my tortoise is new so I just finished sprinting back in forth setting up her little cage and now I'm on a tortoise forum as well and school too... Well I bet I'm just sleeping compared to you and Vicki, HERMEZ.